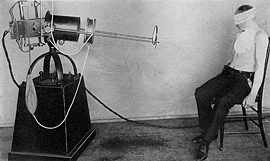 The photographs of children laughing and playing in the sunlight, or of happy results in "after" pictures, correlate to Monteuuis' explanation that treatment by light produced relief, even euphoria, in the patient. In other visual instances, however, patients are being treated in such a way as to suggest tremendous discomfort with the procedure: held down, encased, bound by the hands of the nurse, by cloth or by leather straps. 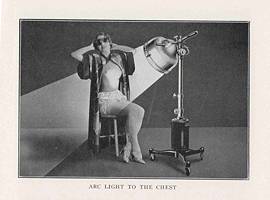 Arc light to the chest, photograph, 1st ed. Arc light to the chest, photomontage, 2nd ed. 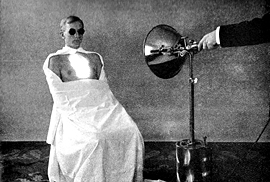 Demonstration of phototherapy equipment, photograph.